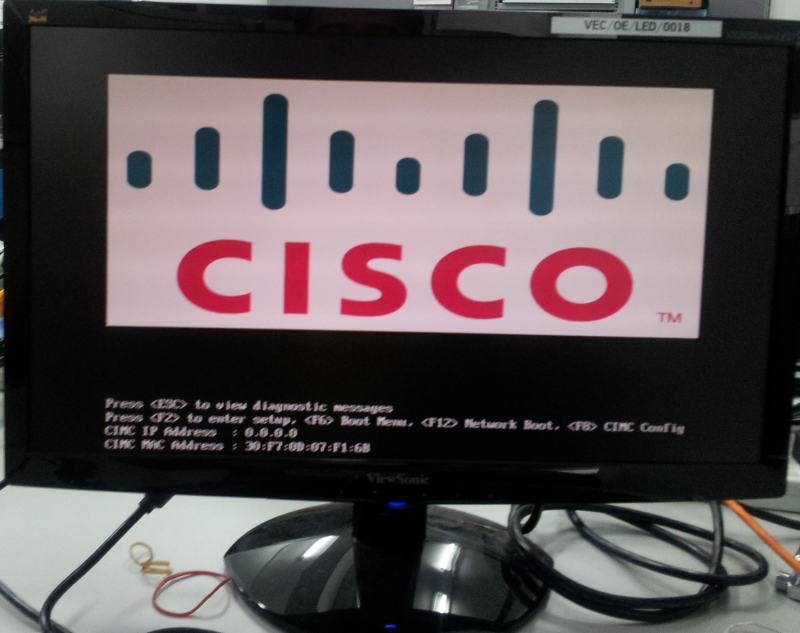 Platform: Cisco UCS C210 M2, 48GB RAM, 10x 300GB SAS HDD. Slot 1 and 2 are RAID1, SLOT3-10 are RAID5. Installing the software is not a direct insert DVD into the server process. The actual process is a pain in the neck. 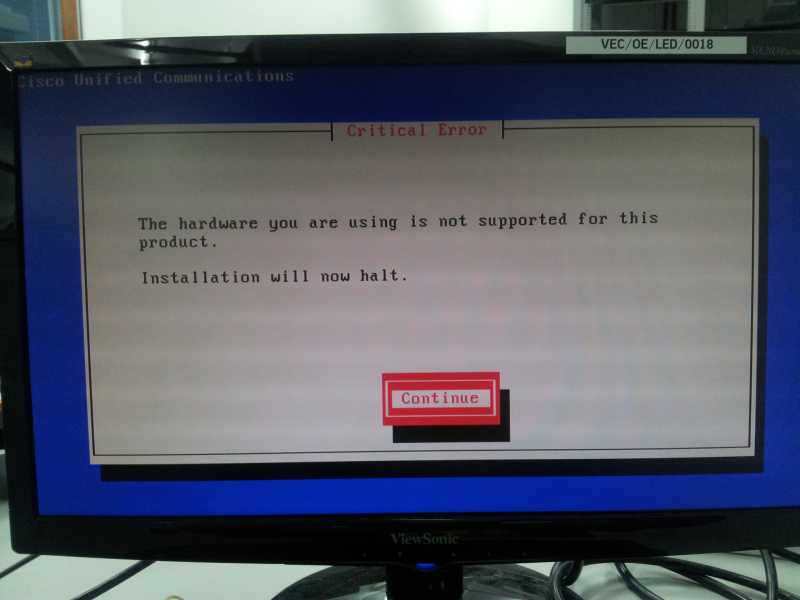 The Cisco Unified Communications Manager DVD actually is a packaged Redhat Linux DVD, however if you insert the DVD and attempt to start the installation, the installation will return a critical error as below. DAFUQ did I just read?! The server specification is extremely powerful however CUCM gave this unbelievable message?! 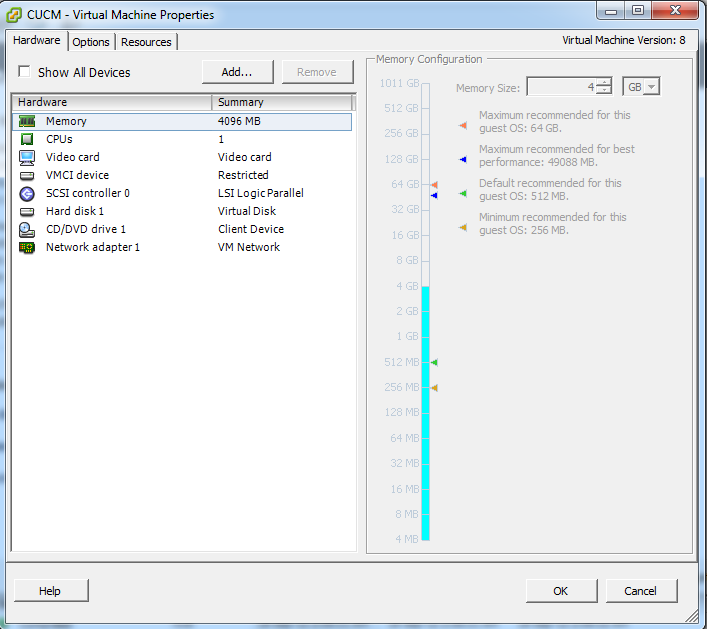 It turns out that the CUCM software is designed to be installed on a VM with far lower specification than the real server. There are many reasons for the critical error to appear one of them is this. There is a Cisco customized VMware ESXi 5.0 available for download, you need to register before you can get the ISO image. Remember to check the hardware the ESXi supports from this page before you begin any installation. If you have the same RAID assignment as I encountered i.e. slot 1 and 2 RAID1, slot3-10 RAID5, you can choose to install the VMware ESXi on RAID1 then create VMs on RAID5. Change the boot order, make RAID adapter the first boot in the order, save the settings and exit, you should see VMware ESXi starts to boot. The setting below is guaranteed to work for CUCM 8.6(2a). Choose the SCSI adapter to be LSI Logic Parallel and use nothing else, other SCSI adapter will award you the same critical error message. There is a very good tutorial created by a CCIE here. The parameters applied during installation cannot be changed again, so make sure the following parameters are absolute and confirmed. The CUCM installation wizard takes NTP very seriously, installation test will be run to ensure everything works before the deployment, if NTP server is uncontactable the installation cannot proceed. Application username and password is for Cisco Unified CM administration, Cisco Unified Reporting and Cisco Unified Serviceability. If you forget Application credential you can change it with your Administrator’s credential, login to the CLI and use utils reset_application_ui_administrator_name for the Application username and utils reset_application_ui_administrator_password to change the Application password. An expert from the Cisco Support forum has summarized the procedure with this indispensable document. This entry was posted in IP Telephony and tagged cisco, Cisco Unified Communications Manager installation, Cisco voice, CUCM, ip telephony. Bookmark the permalink.